This documentary could be used to promote tourism or consumption rates in affected areas. A friendly NJ goes around Tohoku and is friendly to everyone. It’s shown on Japanese TV and everyone sees how friendly everyone is (and how “normal” the portrayal of the area is) and then viewers go there, or buy goods from there. I wonder if a Korean or Chinese person would be chosen? Or would the lucky candidate be of Charisma Man descent? Whoa! I’d love to give them my take on the impact of 3/11 on my experience here in Japan. But I have this feeling it would never make it to air despite it being published in a book (actually two books) already, for i suspect that any viewsthat dont sound paraphrases of the above example will be refuted or refused for innocent reasons like just missing the cut. Thanks for sharing debito. For those that wish to deal with the media in presenting “facts” or “their side”…be very careful. Know they “enemy” first..
You guys are wasting your talents. You don’t need to do this with NHK, and you don’t need to wait, just grab a video camera, and record your (or your friends’) opinions, experiences, etc. regarding the earthquake, tsunami, the uke-houdai radiation, etc., and put them on youtube.com. Your words will not be ‘filtered’ by Japanese media outlets… If you then tell debito, he can help get the word out about your videos. Then people like me can send a link to your videos to hundreds or thousands of our friends. This can happen. But only you guys can make it happen. Good luck. Well, let me hazard a guess…. NHK (which is after all the state broadcaster) is going to select only those NJ who will say things like how sad it is, yet how stoic the Japanese are in the face of adversity, the radiations not as bad as some try to lead you to believe, Japan is great blah, blah, blah…. They are most certainly not going to chose anyone who questions the rate of reconstruction and rehousing, or the spending choices made with funds (rebuilding villages destined to become ghost towns by demographics in the next 10 years, roads in Okinawa, government offices in Tokyo, getting the whaling fleet out), food safety, compensation claims against TEPCO and the government, residents health fears, trucking contaminated debris around the country for incineration, dumping radioactive water into the Pacific….you get the idea. It’s a propaganda exercise. NHK wants to show Japanese viewers NJ saying that everything is going well, and ‘all very Japanese’, so that J-viewers can sit back in Tokyo or further afield feeling like the world knows (after all, I saw a gaijin say it on NHK!) that Japan is doing a top job (^-^)b, and they don’t have to worry their minds with the details of the reality, which is, as we all know an ongoing cover-up of a monumental disaster, that is very far from being ‘safe’. You know what they say; ‘It is written, so it must be true’! Except that in this case it will be; ‘It was on TV, so it must be true’! What the heck is this project all about? Do they think this is some kind of high-school or college project for journalism class? Many of hose have already done their part in reporting the 3/11 earthquake and tsunami, so why need more??? Japanese media blasted off ‘fly-jin’ salvo on NJ for fleeing the country in a panic attack while conveniently ignoring that 1) many of those were asked to leave immediately by their embassies; and 2) the central government failed to give a swift and proper evacuation instructions because they didn’t bother to use high-tech communication gadget–i.e.,SPEEDI at the time of accident? J-media and Team-J downplayed the nuclear crisis and accused foreign media of exaggerating report–to keep our attentions away from the status of nuclear reactors and living condition of survivors in disaster-struck areas in the past–and NHK is giving foreign journalists a whistle for this shenanigan to feed senior corporate executives??? I see NHK’s condescending attitude toward foreign media through this grand scheme–quite insulting. What a shame! I thought of applying to this… for a second, then quickly disregarded it. Having dealt with the Japanese media in the past, they are like any media that simply spins things to what they wish. NJ just are in a slightly more disadvantageous position than Japanese themselves in some respects. I expect a sad spin story as well, and I look forward to a follow up on what they end up producing from this effort. My story was one of mistrust of Japanese TV, especially NHK. Guy Debord would no doubt approve. To seize back the democratic initiative from the Spectacle of state broadcasting, only through spontaneous grassroots initiatives can the democratic process triumph. @ Dude, if China is Orwellian, Japan is more Aldous Huxleyian, i.e. rewarding correct behavior (or promising to) rather than China’s punishing of incorrect behavior. There’s already fine work available on Fukushima by NJ. All of Ian’s work is excellent, and very sad. He knows his way around Japan and works to tell the truth. I watched NHK very day after 3/11, and they worked relentlessly to convince everyone that the situation was under control and the reactors could be brought to “cold shutdown.” They certainly knew otherwise. Today, we know that three cores melted through reactor vessels, and some fear, through containment buildings. The disaster is ongoing and is irradiating the atmosphere and the ocean. NHK simply cannot be trusted. BTW, NJ Arnie Gundersen of Fairewinds.com has spoken widely in Japan, at the invitation of various groups, and has a well-selling book about Fukushima, translated into Japanese. NHK could invite him, but of course he’d tell the truth about the level of contamination, which is severe in many Tokyo hotspots. We won’t see Gundersen on NHK. The linked website provides extensive coverage of the Fukushima accident and is worth following.
. . . There’s nothing. When was the last time you read or heard or saw, regarding mainstream media, any information about Fukushima? Japan had Asia’s sharpest decline in the index, sliding from 22nd to 53rd place in the world. Despite a robust media climate overall in the country, RSF sounded alarm bells over an informal ban placed on independent coverage of subjects related to the accident at the Fukushima Daiichi nuclear power plant in 2011. The organization reported that several freelance journalists who pushed back against the restrictions had been subject to “censorship, police intimidation, and judicial harassment.” Japan’s media also suffered from a more general insularity, RSF reported, where elite press clubs made it difficult for non-members to gain access to crucial information and reporting opportunities. — Which is perhaps why NHK is offering this opportunity. Of course while retaining editorial control. 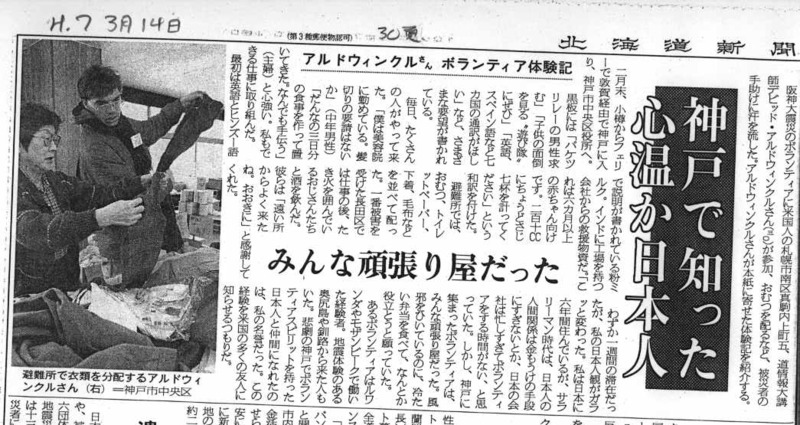 Glad RSF is waking up to the realities of Japan’s Press Clubs at last. 5 big losers in press freedom: Mali and … Japan? Each year, the World Press Freedom Index ranks the world’s nations – 179 of them – on how easy they make the work of journalists, scoring them in categories like media independence, the physical safety of reporters, free speech laws, and transparency. The resulting list reads much like a primer for understanding global conflict: Safe and prosperous countries like Finland and Norway do best, while war-torn dictatorships like Iran, Eritrea, and Syria are among the world’s worst spots to be not only a citizen, but a journalist as well.But while the index suggests that press freedom is frequently a casualty of war – take for instance Mali, which plummeted 74 spots on the list during the past year – it also indicates that those wounds are not always fatal. This year saw massive growth in press freedom in several countries with bloody recent histories, including Ivory Coast, Afghanistan, and Myanmar. These countries can serve as a bellwether for Middle Eastern and North African states struggling to remake themselves in the wake of the 2011 uprisings in that region, says Delphine Halgand, Washington director for the French NGO Reporters Without Borders (Reporters Sans Frontières, or RSF), which released the index for 2012 today. “In these Arab Spring countries we’re still waiting on the promise of new freedoms,” Ms. Halgand says. “This is a really sensitive time for the future of the press there.”	RECOMMENDED: The five most dangerous countries for journalists Elsewhere in the world, however, shifts in journalistic freedom have happened more quietly. Malawi, for instance, marched upward 71 places in a single year on the back of government reform there, while Japan dipped 31 spots based on the government’s handling of press coverage of the 2011 Fukushima Daiichi nuclear reactor disaster.Here are five of the notable winners and losers on this year’s list. Each year, the World Press Freedom Index ranks the world’s nations – 179 of them – on how easy they make the work of journalists, scoring them in categories like media independence, the physical safety of reporters, free speech laws, and transparency. The resulting list reads much like a primer for understanding global conflict: Safe and prosperous countries like Finland and Norway do best, while war-torn dictatorships like Iran, Eritrea, and Syria are among the world’s worst spots to be not only a citizen, but a journalist as well. But while the index suggests that press freedom is frequently a casualty of war – take for instance Mali, which plummeted 74 spots on the list during the past year – it also indicates that those wounds are not always fatal. This year saw massive growth in press freedom in several countries with bloody recent histories, including Ivory Coast, Afghanistan, and Myanmar. These countries can serve as a bellwether for Middle Eastern and North African states struggling to remake themselves in the wake of the 2011 uprisings in that region, says Delphine Halgand, Washington director for the French NGO Reporters Without Borders (Reporters Sans Frontières, or RSF), which released the index for 2012 today. Elsewhere in the world, however, shifts in journalistic freedom have happened more quietly. Malawi, for instance, marched upward 71 places in a single year on the back of government reform there, while Japan dipped 31 spots based on the government’s handling of press coverage of the 2011 Fukushima Daiichi nuclear reactor disaster. Here are five of the notable winners and losers on this year’s list. After tumbling 27 places in the rankings between 2011 and 2012, the United States recovered significant ground this year, rising 15 slots to 32nd. Last year’s downgrade was the result of police crackdown on reporters covering the Occupy Wall Street movement, which led to the imprisonment and beating of more than two dozen journalists, according to RSF. This was not the first time the American position in the ranking took a sudden nosedive – the US fell 20 places between 2004 and 2005 at the height of government-media tensions over the war on terror. “Even the US media climate reflects [political upheaval],” Halgand notes. But just as the US began to right itself this year, Canada dropped 10 spots to 20th as a result of press difficulties in covering the widespread student protests there. But neither the US nor its northern neighbor came close to the press freedom enjoyed in the Western Hemisphere’s highest ranked nation, tiny Jamaica, which clocked in at 13th. Last year was not kind to the Malian press corps. Early in the year, mutinying soldiers seized control of the capital, while in the country’s north, Tuareg separatists – and later, Islamist rebel groups – brought large swaths of territory under the rule of their own guns. Over the course of the year, news organizations in the north found themselves censored by rebel groups, several local and international journalists were assaulted in the capital, Bamako, and a large number of radio stations were forced off the air. Once “the continent’s star performer in democracy and press freedom,” according to RSF, Mali plummeted 74 places on the Press Freedom Index in 2012 – from 25th to 99th – the single largest decline of any country in the world. Although it remains in the dubious company of Iraq (#150), Russia (#148), and Mexico (#153), Myanmar is something of a success story for press freedom, says Halgand, of RSF. The country rose 18 spots this year and has made small but significant lurches toward a free media – there are no longer any journalists in the country imprisoned for their work, for instance, and media outlets exiled by the former military dictatorship are slowly being allowed to return. Myanmar has also eliminated the policy of prior censorship, where media content was suppressed before its publication, and RSF researchers were able to return to the country in 2012 after several years of blacklisting, Halgand says. The world’s deadliest country for journalists over the last year, Syria saw the killing of at least 17 professional journalists, 44 so-called citizen journalists – amateurs responsible for the regular dissemination of media ­– and 4 media assistants in 2012. Prominent among them for many western observers were American reporter Marie Colvin and French photographer Remi Ochlik, who died in February during the siege of the city of Homs. The country as a whole has spent years in a near complete media blackout – it ranked 173rd on the list even before its civil war began, in 2010. But the current conflict has made the sources of media oppression more diffuse, putting journalists in danger of being targeted not only by the government but by opposition groups as well. “Pro [President Bashar Al-]Assad propaganda, the spread of false information, the hacking of email and social networking accounts, phishing etc – a veritable information and disinformation war is being waged in Syria,” RSF wrote. Not just in the Japanese media do you not here much about Fukushima, but also media outlets around the world seems to have suddenly became silent about this issue. I am guessing Fukushima is one of the possible reasons why politicians and nationalists alike are trying to escalate local xenophobia. The GOJ is trying to convince the people that NJ is a bigger threat than Fukushima and all of Japan’s local problems combined. Thus leading to a gross exaggeration foreign threats in their media as means of controlling the populace. I also noticed how ever since the LDP got re-elected, their prime focus are often on subjects that are outside of Japan. It is somewhat possible that the GOJ may have purchased the Senkaku islands in order to divert focus away from Fukushima. Shredding Article 9, appears to have became the LDP’s highest priority along with giving big corporations bailouts. The commoners are fed xenophobia while the Fukushima victims are given at best a few words of support along the usual lines of “gaman” and “gambatte”. The GOJ probably knew that Fukushima will likely open up a whole can of worms if the media focuses any more time on it. Which is why I think that Japan Inc. is furiously working overtime in their nationalism and xenophobia department. PARIS (Jiji Press)–Japan plummeted to 53rd from 22nd last year in the 2013 press freedom ranking released by Reporters Without Borders, a Paris-based nonprofit organization, on Wednesday. Japan “has been affected by a lack of transparency and almost zero respect for access to information on subjects directly or indirectly related to Fukushima,” the group said in a statement, referring to the crisis at Tokyo Electric Power Co.’s crippled Fukushima No. 1 nuclear power plant. “This sharp fall should sound an alarm,” it added. Mali logged the sharpest fall this year, to 99th from 25th, following a military coup in 2012 and the capture of the country’s north by Islamist militants, leading to French intervention. @Bayfield (#15) Watching the news shows during the last couple of days, it seems like the Japanese media (de facto overseen by the government) is trying to create a “Chinese air pollution is invading Japan” scandal, basically saying that the air in all of Western Japan is currently “dangerous” to breathe in. Googling for international news on this topic, next to nothing can be found. The way the J-media is putting is seems to paint the situation as deliberate, i.e. China is somehow polluting Japan on purpose. It seems Asia is supposed to shrug off Japan’s pollution of the sea and air with radioactive isotopes – maybe because “Japanese radiation is different” ? — Tell us what news shows. Dates and times if possible please. “News Zero”? Now that is a postmodern sign that does mean what it says! Though they should reverse the word order to reflect the content of the program. The real problem with his analysis, however, is that it doesn’t necessarily follow that it was “likely a seismic problem” that caused this. If anything, a buckle is generally not a sign of seismic activity, so absent evidence to the contrary this would be a lousy assumption to make (a shear failure is generally more indicative of seismic activity). This is not to say that he is necessarily wrong, but he needs to provide the evidence, which neither he nor anyone else has provided to my knowledge. As for Karl Grossman, what can I say. Debito has been kind enough to link to many mainstream news articles about the Fukushima situation on these pages. My guess is that Karl is just disappointed that they aren’t running the stories that he wants to see (i.e., about “lots” of people “all over the world” ending up dead because of this). This is because mainstream media typically try to verify their stories with experts, like respected engineers, environmental scientists, health physicists, etc., before running them, and none of those people actually think that “lots” (whatever that means) of people “all over the world” will end up dead because of this. Enenews and Mr. Grossman clearly have no such inhibitions. — Alright, we’ve had the argument, and now the counterargument. And we’ll stop this thread here as it’s not germane to this blog entry. Ian documents widespread coverup of the truth about radiation contamination. His work is important, but it’s not likely NHK will want to talk to him. Older link but not widely noted that the Kisha actually bullied non Kisha journalists and prevent them from asking probing questions; not unlike the pro Govt thugs or media in former Libya, Syria etc. It was a shocking revelation for a majority of the people in Japan, but maybe not so for major media organizations. Tsunehisa Katsumata, chairman of Tokyo Electric Power Co., admitted in a news conference on March 30 that on the 11th, the day the twin disasters hit the Tohoku region and crippled Tepco’s Fukushima No. 1 nuclear plant, he was traveling to Beijing with retired Japanese journalists, expenses for which were partially paid by the utility. “We probably paid more than our share” of the travel fee, Katsumata said. Internet reporter Ryusaku Tanaka was shouted down by other journalists as he tried to question the Tepco executive. The incident laid bare the oft-assumed cozy relationship between Tepco and major Japanese media organizations — members of the exclusive “kisha” (press) club that critics claim are preventing reporters from asking the utility tough questions about the nuclear accident. Similar complicity has long been assumed at other press clubs attached to the nation’s various bureaucratic bodies. Freelance journalist Takashi Uesugi, a former reporter for The New York Times in Tokyo, said he was astonished that no one had asked Tepco about whether a plutonium leak from the stricken plant was detected until he raised the question on March 27. Experts have warned that plutonium may have been released from the No. 3 reactor, where MOX fuel is stored, due to a hydrogen explosion on March, 14 in addition to radioactive iodine and cesium. MOX fuel is a mix of uranium and plutonium oxide. A day after the unthinkable revelation, Tepco announced it detected a small amount of plutonium from the soil on the plant’s premises after it sent soil samples to an outside organization for analysis a week earlier. A strong advocate of abolishing kisha clubs nationwide, Uesugi is one of the 22 members who founded the nonprofit organization Free Press Association of Japan in January aimed at pushing the clubs to allow nonmembers to attend news conferences. Kisha clubs are mainly attached to government ministries and industries, and their members generally belong to major newspapers, broadcasters and wire services. In many cases, however, their membership is limited to major domestic news organizations, triggering criticism for screening out foreign press, magazine reporters and freelance journalists. But since March 11, the exclusive clubs have been forced to open up to nonmembers. Nonmembers have only been allowed to attend the press conferences held by Chief Cabinet Secretary Yukio Edano once a week even after March 11. But feeling the need to allow as many media as possible amid the disaster, the kisha club covering Edano allowed an Internet media organization to broadcast his news conference live from March 17, albeit on a temporary basis. Still, the exclusivity of the clubs is notorious among foreign reporters in Japan. David McNeill, a Tokyo correspondent for the Independent, recalled how nonpress club reporters were shut out when the Tokyo Detention House opened its execution chamber for the first time to the media last August. Despite numerous inquiries with the Justice Ministry, which oversees the detention house, ministry officials as well as its kisha club claimed the date was not set yet, and went ahead with the press tour without informing the foreign press, magazines and freelance journalists, he said. McNeill later learned the kisha club members were told by the ministry to keep the tour date secret to nonmembers. “It’s a symbiotic relationship,” said McNeill. The Justice Ministry was able to control the information to a large extent by allowing only members of the press club onto the tour, just as kisha club journalists are granted information nonmembers don’t have, he said. But it is not the nonmember journalists losing out in this game, he said. “The losers are ordinary Japanese people because they don’t hear all the information that they need to make rational political choices,” McNeill said. He indicated that the reason the support rate for the death penalty is unusually high in Japan may be because people are not well informed about what goes on in the chamber, including the fact that people in wheelchairs are executed or that prisoners on death row wait decades not knowing when the execution will take place. “So you wonder, would it be as high if ordinary people knew everything about what goes on in the system,” McNeill said. Though often a target of criticism, the kisha club system has played a key role in forcing the government and authorities to disclose information to the public, supporters claim. Formed in 1890, it started out with a small number of reporters who formed a group demanding the Imperial Diet to allow them to sit in on sessions. Since then, kisha clubs have become key channels for media organizations in making collective demands against the authorities and vice versa. Nobuaki Hanaoka, former head of the daily Sankei Shimbun’s politics division and a kisha club advocate, claims magazine and freelance journalists are more focused on getting flashy quotes in news conferences that may interfere with the reporting of newspapers and other press club members. “When you report on politics, it’s not like there is a press officer in the Diet telling you what would happen. Nearly 100 reporters gather information day and night and write stories on what is likely to happen,” Hanaoka said. The situation, however, changed drastically after the Democratic Party of Japan, which promised to open up news conferences to nonmembers of kisha clubs, ousted the long-ruling Liberal Democratic Party in September 2009. To keep the promise they made during the campaign, newly appointed ministers of the DPJ-led government started to open up news conference to nonpress club members as well. But video journalist Tetsuo Jimbo, one of the founding members of the FPAJ, said the organization was established to make sure the DPJ’s move of opening up press conferences will not threaten the basic premise that the media should hold the news conferences. If authorities host press conferences, there is always a risk that those in power will try to manipulate information, including ending news conferences whenever they wish. Because press clubs were reluctant to allow nonmembers to attend news conferences, the DPJ-led government must have thought it would be quicker and easier if the government hosted the news conferences instead of press clubs, he said. “We had to create a cross-sectional organization of journalists that can host press conferences,” Jimbo said. Thanks to the DPJ, some kisha clubs have opened up to nonmembers. But Jimbo claims his fight is not over until nonmembers have equal rights, including the number of people allowed in venues, and have a say in how press conferences proceed. Still, critics agree the DPJ’s push to pressure the press clubs to open up the news conference was a big first step. McNeill of the Independent vividly remembers when then Foreign Minister Katsuya Okada held the first news conference open to all members of the media, including nonpress club members, in September 2009. “That was one of the most interesting press conferences I’ve ever been to in Japan,” he said.